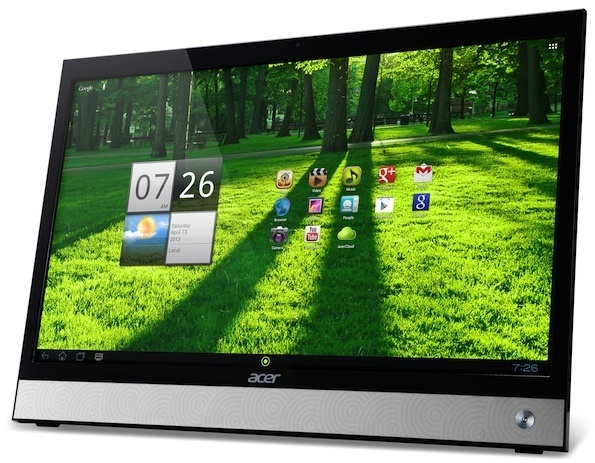 This new Android on PC from ACER certainly raises the ante on the Android game. This ACER AIO model DA220HQL has been introduced into the market. The official data about this very appealing AIO Android on PC includes a 21.5 inches LCD touchscreen, 1 Gb RAM and 8 or 16 Gb of memory. The price tag at Bestbuy at the time of this writing on their online store is about USD 400, which sounds appealing too. Certainly a bold move into desktop computing for Android, by one of the biggest consumer computer hardware companies in the world. What is the correct mind frame for this Android device ? Well, “a big tablet” might fit the bill. Of course, it comes with Google Play Store pre-installed. But as some early users rant on their reviews, it seems that not all the apps are present in there. They mention Spotify as one of the missing apps. It wont run Flash content (as happens with almost every recent Android Device). On the other side, you will find Netflix. Proven that you may first test-drive this Android on PC from Acer and verify that all the apps and games you may need are already in place on the Google Play Store, then it may end up being a better purchase than a 10 inch tablet, while keeping the price on the same ballpark. Behind the full HD resolution 21.5 incles tactile LCD, you will get a 1Ghz Texas Instruments OMAP 4430 processor. Listed on the product specs, we also find a webcam, bluetooth, wifi, a wireless keyboard and a mouse. Quite the package. Definitely worth the money Acer asks for it’s AIO Android on PC. On top of all the nifty hardware you will find Android 4.0 operative system at your fingertips. is there any powerfull android pc that has a tablet size display (7 in)? Joe, what is powerful for you ? My kids 7 inch Android tablet has a quadcore processor, Tegra 3 Chipset, 2 Gb ram and 16gb of flash memory … “as good as it gets”!